The RMS value of alternating current is given by that steady current (DC) which when flows through a given resistance for a given time produces the same amount of heat as produced by the alternating current when flow through the same resistance for the same time. For example, if we say that 3A alternating current is flowing through the circuit, it means the RMS value of alternating current which flows through the circuit is 3A. It produces the same amount of heat as produced by 3A direct current. The ammeters and voltmeters record the RMS values of alternating current and voltage respectively. In the India, domestic single-phase AC supply is 230 V, 50 Hz. Where 230 V is RMS value of alternating voltage. The term RMS stands for the (square) root of the mean of the squares of instantaneous current values. The RMS value of AC is always greater than the average value except for a rectangular wave when these are equal. Its value can never be negative. The RMS value of sine current wave can be found from the area of its half-cycle. It applies to all waves whether sinusoidal or non-sinusoidal, symmetrical or asymmetrical. where, Im is the peak value of AC Current. 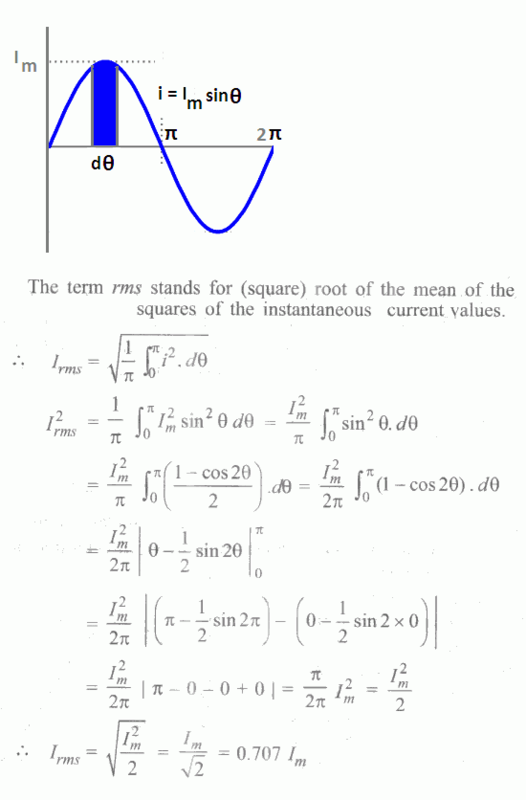 © http://www.yourelectricalguide.com/ rms value of ac derivation.